The post E-GMAT: A New and Better Approach to GMAT Prep [Episode 304] appeared first on Accepted Admissions Blog. Have you been accepted to b-school? Do you want to win $500? Help others get to where you’ve gotten by sharing your experiences in the 2019 AIGAC survey. This survey is for applicants who have been admitted to one or more business schools that start Aug./Sept. 2019. Your survey results will help everyone involved in the admissions process – from the business schools themselves to consultants like us to applicants like you. You can read more about AIGAC (Association of International Graduate Admissions Consultants) and this survey here. Do your part to help out those around you by taking this survey by March 31st – plus, you’ll be entered in a drawing to win $500! The post Share Your Experience. 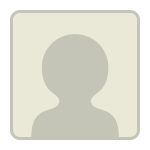 Take This Survey appeared first on Accepted Admissions Blog. Not proud of your undergraduate GPA? Concerned it may ruin your chances of getting into a top MBA program? It’s time to tackle this issue head-on and create a plan for successfully applying to business school with a low GPA. What defines a low GPA? Maybe you’re a perfectionist and you’re bummed about your 3.9 GPA, so let’s be clear about what “low” really means. First, please – if your GPA is more than 3.7, you’re FINE (in this area at least). Save your worry-energy for something else. One that is at least 0.3 points below your target school’s average GPA for accepted students (on the U.S. 4.0 scale). One that is below your target school’s 75th or 80th percentile. You can find this info in the Accepted Selectivity Index or the school’s class profile. Both of these definitions require you to look at your numbers relative to those of the schools that you are targeting. So if you have a 3.2, and the average GPA of the entering class is a 3.2, then you do not have a low GPA. However, if you have a 3.2 and the school you are aiming for has an average GPA for accepted students of 3.6, then all of a sudden your average 3.2 GPA transforms into a low 3.2 GPA. Did you have a hard time adjusting to college, so your GPA took a hit your freshman year, but improved the following year, and then every year after that? Did you end up recovering from that first clueless year by landing on the Dean’s List for the last two years and having a 4.0 GPA the last year? Did an illness in the family or other circumstance beyond your control cause a drop in your grades for a specific period of time, thereby dragging down an otherwise tip-top GPA? Did you declare the wrong major and have poor grades in that major until you realized your true calling, at which point you started to excel? Were you working part-time to support yourself or did you have a major sports commitment in order to qualify for an athletic scholarship that you needed to maintain in order to stay in school? Did your GPA have a downward trend, starting out strong in your first year, and then declining as you lost your motivation throughout the following years? These questions present several causes that could explain a low GPA in order of difficulty in overcoming them (easiest to hardest). The degree of severity of your case will influence how much effort you need to put in to mitigate the situation. Your goal will be to convince the adcom that your GPA isn’t an accurate reflection of your abilities and that you’re capable of much, much more. Here’s what you need to do. You need a high GMAT score. The test score indicates you have the raw talent and aptitude for your chosen field. Take a class or two (or more) in a quant or verbal subject (depending on where your weaknesses are greater). Maybe even pursue another degree. But no matter what you do, make sure you’re ready to study hard and earn those A’s. This is your last shot at demonstrating that you are a good student with strong skills and you’ve got what it takes to excel in b-school. With an above average test score and evidence that you can perform academically, you are well on your way to dealing with that low GPA. Use the optional essay to provide context to your GPA, showing that whatever contributed to your poor performance is either not a factor in your life anymore or is something that you’ve learned how to deal with so that it doesn’t affect your performance any longer. Whatever your reasons may be (extenuating circumstances or circumstances totally beyond your control), explain the situation in a straightforward, honest manner. For real mistakes that you’ve made, fess up, take responsibility for your actions, and indicate that you are a changed person who has learned lots and moved forward. But no whining please! MBA admissions is about much more than your GPA. You cannot look at any single number and focus exclusively on it, especially once you weigh in the circumstances that led to your low GPA and the trending direction of your GPA. Your GPA also doesn’t at all reflect the impact of your diversity and non-academic experiences – important factors taken into consideration by adcom members. When you are admitted to b-school (or rejected, for that matter), it is due to the complete package, the holistic sum of all your parts. Yes, your GPA is extremely important, and you’d be unwise to think otherwise – but it’s not the be-all and end-all of your admissions profile. Work hard, demonstrate your academic abilities in other ways, and prove to the adcom that you’re ready to hit the books and ace the heck out of b-school. Do you need help evaluating your profile, deciphering your stats, and creating a strong MBA application strategy? Our admissions advisors have worked with thousands of applicants and know what works and what doesn’t when it comes to every aspect of the admissions process. Check out our MBA Admissions Consulting & Editing Services and work one-on-one with your personal advisor who will help you get ACCEPTED. 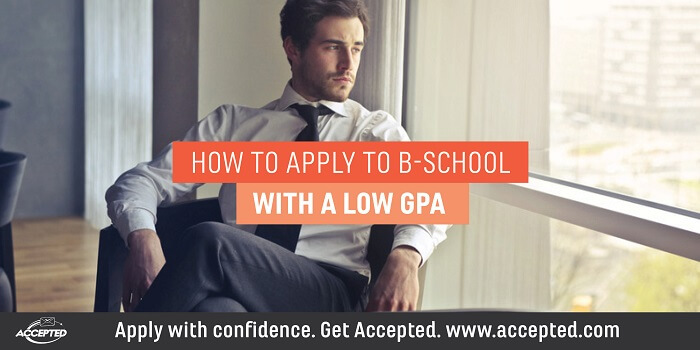 The post How to Apply to B-School with a Low GPA appeared first on Accepted Admissions Blog. 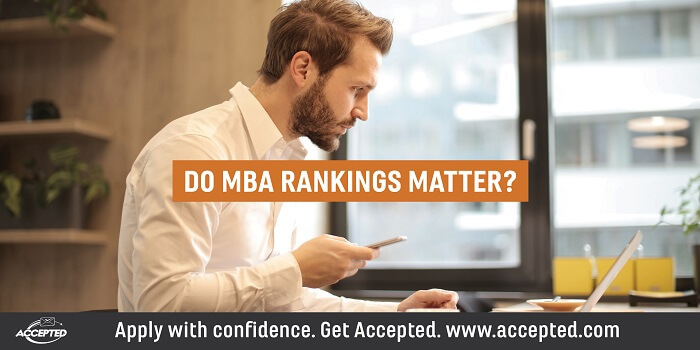 FROM Accepted.com Blog: Do MBA Rankings Matter? You’ve defined your goals and assessed your qualifications. Now it’s time to move on to the program research stage of the MBA admissions process. There is a sea of information out there: rankings, books, MBA program websites, MBA fairs, Poets & Quants, student and adcom blogs, school open houses, your neighbor’s sister’s boyfriend’s dad – the list goes on and on. Where do the rankings fit in? If you’ve read our blog, attended our webinars, read our admissions guides, etc., you know we caution against relying exclusively and uncritically on rankings to decide where to apply (so that means no “I’m just going to apply to the top 5”). Well, here we’re going to suggest the opposite: use the rankings…at the beginning of this research phase, because they are helpful at the start. But don’t stop with the rankings. Below you’ll find 6 key steps for doing MBA program research in a way that a) yields meaningful info for decision-making and list-making, and b) is efficient and focused – conserving and respecting your precious time. With your competitive profile in mind, look at several broad MBA rankings. Determine what levels/ranges of programs for which you’re competitive generally (taking into account reasonable reaches, on-pars, and maybe safeties). Note the plural – rankings – as each has its idiosyncrasies (U.S. News,Financial Times, Bloomberg Businessweek, etc.). Sometimes a program will be below or above your target competitive range, but it still might make sense to apply for some reason (in the following steps you’ll gain the additional info needed to make this decision). At this point it’s good to start talking to people with MBA experience – colleagues, friends, mentors, etc. – and add a qualitative dimension to the above step. Ask about their impressions and experiences, and assess how their views align (or not) with what you gleaned from the rankings vis-à-vis competitive fit. Research industry- and/or function-specific rankings in your area(s) of interest. Identify programs from these rankings that overlap with those from Step 1 (and factoring in any learning from Step 2). Go to the source – the websites of programs that interest you. Look for specifics that you care about (structure of curriculum, flexibility, appealing concentrations, students from a given industry or geographic region, placement strengths, etc.). Listen to your gut as well as your objective response; does it feel like a good fit? Remember, you can keep the rankings info in mind as you look deeper into your target programs. For example, check the schools’ average GMAT and GRE scores – are your scores within range? What better way to understand your fit with a school than to see the students, professors, and administrators in action? You will get the most out of MBA fairs and school information sessions at this point in your research, after you already have a good idea of what each program offers and how you’d fit in competitively. If you can swing it, a school visit will really help you get the vibe of the schools you’re considering. A school may seem perfect to you on paper, but if you step on campus and feel like a fish out of water, you may disqualify the program (though, be sure you’re giving it a fair chance). On the other hand, if you visit a school that you were iffy about and immediately “click” with the school, that’s a great sign that a program that may not have seemed like “the one” should become a top contender. You’re narrowing and refining a list. Now it’s time to focus more on adcom and student blog posts, searching the web for articles and information, and attending school information sessions, and of course, continuing to talk to people with MBA program experience and insight. You should now have a finalized or near-finalized list of programs to apply to. You can continue refining the list and deciding on other programs to add later. NOTE: This is a guideline, not a rigid process. Always stay open to discovery – maybe you’ll come across a school in a blog or a respected colleague suggests a program you hadn’t considered. Maybe you thought you wanted to stay in the U.S. but were seduced by INSEAD… Who doesn’t love a pleasant surprise? The most important thing you need to remember is that while the rankings are useful, they do not offer you a complete picture. So now I’d like to present you with the other side of the story – the rankings’ limitations. Blinding yourself to the rankings’ flaws could lead to an expensive, time-consuming mistake: choosing the wrong MBA program for you. They don’t measure your priorities. The rankings are general reports usually based on some data and survey responses from students, alumni, and faculty…none of which include you (yet). You can gain valuable information from the rankings, as we’ve discussed above, but when it comes down to it, they measure the responses and priorities of others; take them with a grain of salt and realize that everyone’s situation and experiences are different…yours included! General rankings hide strengths (and weaknesses) in specific areas. There are numerous “gem” programs that thrive outside the top ten or top twenty. Many MBA students have a great chance of gaining acceptance PLUS receiving financial aid at these gem schools. Sure, getting into Wharton would be a huge accomplishment. But what if you got accepted to Washington Foster, got a full scholarship, and found that when you visited the campus, you felt right at home? Then the fact that Foster doesn’t sit in the top 10 may not matter nearly as much. Averages are exactly that. Average. They aren’t a cut-off and don’t reflect extenuating circumstances or the interplay between myriad factors in an admissions decision. At every school there will always be applicants who are accepted with below-average stats and who are rejected with above-average stats. Surveys, especially surveys of students and alumni, can be gamed. Students and alumni know that higher rankings increase the value of their degrees and have an incentive to think kindly of their schools. In short, don’t give the rankings too much importance. Don’t replace school research and self-reflection with rankings to determine where you should apply or attend. Do you need help discovering the MBA programs that are the best fit for you, or assistance on any other element of the application process? Review our MBA Admissions Services and work one-on-one with an expert advisor who will help you get ACCEPTED. The post Do MBA Rankings Matter? appeared first on Accepted Admissions Blog. You want to apply to business school but are worried about your lower-than-ideal GPA. Don’t worry – it’s NOT the end of the world! Explaining a low GPA can be difficult, but it can be done. The first thing you need to do is examine your GPA’s trend. Once you understand this, you’ll have an easier time explaining to the MBA admissions committee what happened. You goofed off for your first few semesters and didn’t weigh the consequences. You failed some classes and started out with an embarrassingly low GPA not because of lack of ability, but because of immaturity. Mid-sophomore year you wised up and continuously hit above the 3.8 mark for the rest of your undergraduate career. Your college experience started out with a motivated streak of genius – three solid 4.0 semesters in a row. But then…things took a turn towards apathy and laziness and your grades began to suffer significantly. You work hard, but not too hard. You take some classes seriously, and some not so much. You never really cared about school or grades to really put the effort in. A few years out of school and a life-changing career move have motivated you to new heights and you want to apply to b-school. But now you need to deal with your less-than-impressive record. If you’re like the student in Scenario A, then you don’t really have too much to worry about (unless you’re applying to a top MBA program for which a 3.0 GPA is a significant hurdle). Many students early in their college careers have a couple of bad semesters because of immaturity. Your grades went up, proving your capabilities and your increased maturity. If you’re more like Scenario B’s student, then you may be in more of a bind. You’ve proved your abilities by acing those first few semesters, but why the dramatic downturn? Did things get too difficult for you? Do you have trouble performing under pressure? Or do you just not care about improving and perfecting your academic capabilities? The problem of mediocrity looms over you if you’re like our Scenario C student. 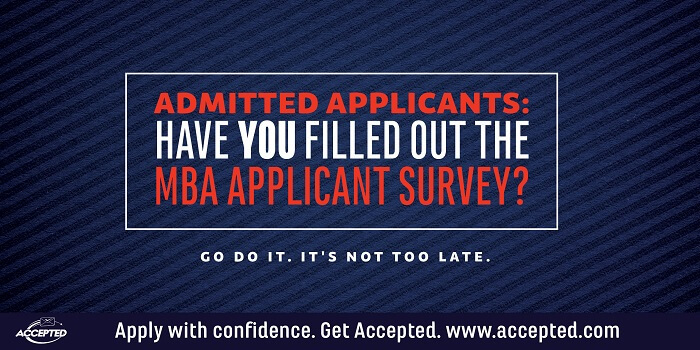 You will need to prove your skill level if you want to be considered for a spot in the next MBA class. Student A: You don’t need to prove ability as much as motivation and seriousness, which you may have already proven with your last few years of work. You may want to ask one of your recommenders to vouch for your maturity and steadfastness. A high GMAT/GRE score will help. Student B: You will need to enroll in some college courses to prove your verbal and/or quantitative abilities (especially if your test scores weren’t so great). You’ll want to make sure your essays express your newfound motivation as well as your keen writing abilities. Your essays should include clear anecdotes that illustrate how you’ve matured since your last few semesters and how your skills should be judged based on recent work experience, rather than past college experience. Student C: You’re in a similar boat as Student B. You’ll want to retake some of your math and English courses and you’ll want to get solid A’s this time. B’s and C’s just won’t cut it if you want to prove you’re b-school material. Strong essays and letters of recommendation will also boost Student C’s chances of acceptance. Of course many of you will not be like Students A, B, or C. Your grade-dive may have resulted from illness or family crisis or circumstances beyond your control. Or perhaps steady, mediocre grades resulted from your working 20-30 hours per week to support yourself through school. There are many other scenarios too. The key is to prove that today you have the ability to excel in your target MBA programs and that the circumstances that contributed to the poor marks in college no longer affect you. Moral of the story: A single low number can be explained or put in a less damaging context with hard work and a solid application strategy. And the consultants at Accepted CAN HELP. Check out our MBA Admissions Consulting Services to learn more about how we can guide you to acceptance at your target b-school, even with that imperfect GAP! 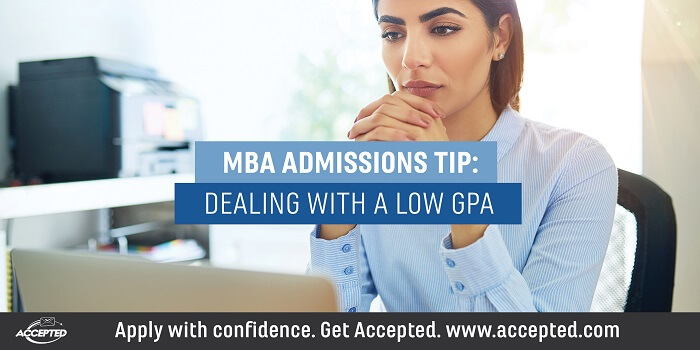 The post MBA Admissions Tip: Dealing with a Low GPA appeared first on Accepted Admissions Blog. FROM Accepted.com Blog: Can You Improve Your B-School Stats In 1 Hour? Well, maybe you can’t literally change your numbers – but here’s what an hour of your time can do: You can learn how to understand your stats and their significance for your application, and also (most importantly!) learn how to mitigate low stats in your MBA applications. It’s understandable that your GPA and GMAT score could induce anxiety – we get that. We know that the application process is hard as it is, especially if you’re dealing with low stats. That’s why we’ve created How to Get Accepted to B-School with Low Stats, a webinar that addresses precisely these concerns. Accepted’s founder, Linda Abraham, will show you how to decipher your profile strategically so that you can mitigate weaknesses, emphasize strengths, and get accepted. There’s still time to register for How to Get Accepted to B-School with Low Stats – reserve your spot now! The post Can You Improve Your B-School Stats In 1 Hour? appeared first on Accepted Admissions Blog. These are the fretful “buts…” of MBA applicants who fear their applications will be doomed by a poor undergraduate GPA. Behind every GPA is a story. Often it’s a story that arouses frustration, confusion, uncertainty, and even anguish on the part of applicants. Your undergraduate GPA is important – this is true – but adcoms view your GPA (like the rest of the application) holistically. And this isn’t just how they view low GPAs, but how they view all GPAs. First, no matter how well or how poorly your GPA represents your actual ability, the adcom will consider it and take note of it when reviewing your application. You cannot, by convincing explanations or subsequent courses, erase a low undergrad GPA from adcom consideration, but you can work to mitigate it, sometimes substantially. Second, the adcom will examine the context of your GPA. They can see some aspects of that context automatically when they look at your transcript (like rigor of courses and school), but for other contextual hints (like pneumonia during your sophomore year), you will need to state them directly, usually in an optional essay. They will see whether your GPA trends up (good) or down (a problem that might need explaining), and they will see from other areas of your application whether you were working during school and/or participated in a lot of activities, etc. If you worked while you were in college, the admissions committee will probably assume you had to, and so will be less likely to blame you for time management challenges that weren’t necessarily your choice. If you started college in the U.S. barely knowing English and struggled for a year or two until your passion and ambition propelled you to the dean’s list, then you should explain this particular challenge in an optional essay. If the adcom sees lots of activities, they’ll note the positive aspects (sociable, contributor) and the possible negative aspects if your GPA was low (less than great time management and prioritizing). If your GPA trends up, they may understand that you were just a kid still growing up, and will most likely view your last two years as more representative. They’ll also note things like change of academic focus (like your grades really improved once you switched your major from physics to East Asian Studies). Part of your job in writing your application is to anticipate and envision the context the adcom sees for your GPA and fill in the gaps. For example, if an overabundance of activities undermined your grades, you can show in your essays how you subsequently learned to better manage your time while maintaining your vibrant community involvement. Moreover, good GPAs are not just given an “OK” from the adcom. They actually review your transcript. An otherwise strong GPA that has one C in your only quant course could raise an eyebrow. So could a GPA that starts very strong and trends down – even if it’s solid in aggregate. Post-undergrad efforts also shape the context of your undergrad GPA. A strong GMAT, demanding professional certifications, an “alternate transcript” of courses to demonstrate academic capability and counter a low undergrad GPA, and/or a strong grad school GPA all will help to mitigate a low GMAT – but again, they will not erase it from your profile. They will have other positive impacts though, such as showing commitment and maturity. The adcoms’ use of context in evaluating GPA means ultimately there is no one formula applied. It’s nuanced, unique to the candidate, and qualitative. Try to see your GPA in their eyes to determine (a) if you need to provide context for your performance, (b) if you should take steps to mitigate your low GPA like additional courses, and (c) whether your GPA in its holistic context enhances your candidacy at a given school. Need help evaluating your admissions profile to determine what actions you need to take to boost your competitiveness? Need assistance creating an application that highlights your strengths and mitigates your weaknesses? Check out Accepted’s MBA Admissions Consulting & Editing Services to learn more about how our expert advisors can help you get ACCEPTED. The post How MBA Adcoms Evaluate Your GPA appeared first on Accepted Admissions Blog. Merging two hot new programs — analytics and management — as well as online delivery so that you don’t need to leave the workforce, NYU Stern has created a new exciting entry in the master’s in management and data analytics space. Let’s learn about it from the Vice-Dean for Online Education at NYU Stern. In this interview with Dr. Kim Corman, Vice Dean of Online Learning at NYU Stern, she discusses Stern’s brand-new online option in graduate management education. Aimed at early-career applicants, the program merges two degrees in demand: data analytics and a master’s in management. Our guest today is Dr. Kim Corfman. She is a Professor of Marketing, NYU Stern’s Vice Dean for Online Learning, and Academic Director of Stern’s MBA in Fashion & Luxury. She has served previously as Vice Dean for MBA Programs, Academic Director of the Langone Part-Time MBA Program, and coordinator of the doctoral program in marketing. Needless to say she knows a ton about management education and NYU Stern, and as I mentioned, today we’re going to talk about Stern’s brand new MS in Quantitative Management. The program is a combination of things we’ve never done before and is designed for a market need we didn’t feel was being met. It is for people without business degrees, and combines the business essentials (essentially MBA core courses) with an emphasis on analytics. It is designed to help professionals become more able to use data, which is very important to their professional success – how to ask for data, analyze it, and make decisions from it. It is online and you can attend from anywhere, with two short residential immersions each August, offering the chance to meet the cohort and do interactive face-to-face work. The program is lockstep and fits well with working professionals’ schedules, and can reach people all over the world. We could have developed an online master’s in management, but are sensitive to the fact that most of our MBA students find the most benefit to their careers from more analytics than they thought they needed. It is critical everywhere and the new business essential. Any working professional has greater demands on their time, but our format makes it much easier to do. In a given week it is self-paced, with optional synchronous Q&A sessions with faculty, and various deliverables each week. We are looking for people who know how to do well in whatever they have done in the past. They have taken courses that challenged them and have succeeded in them, and who know why they are taking this program. We take people with backgrounds in social science, liberal arts, natural science, engineering, everything. We don’t require quantitative coursework per se, but applicants do have to take the GMAT, so a quantitative assessment is part of the process. Applicants who know why they are doing this, and that it fits with their objectives. We also want good community members. While this program is online it has the same needs – students are working in virtual teams throughout the program. We don’t require any work experience. We are open to applicants who have just graduated from college and even with no internships. No academic or professional background is required, but a plan is important. It may be someone who wants a business career but doesn’t have one yet, or someone in an entry-level job that needs the business basics and has an appreciation for the importance of using data. There is no maximum amount of experience but the program is definitely not for mid-career or more senior professionals. It is much like the application process for the MBA. We ask about academic background and professional background. There is one essay where we ask about the applicant’s career plan and how the program fits into that. We have an optional essay for anything additional the applicant feels is important to tell us, and a recommendation. Some applicants are invited to interview if we are not 100% sure if they would be a good fit, but most are admitted without an interview. Interviews can be done online or in person. Our MBA students all have work experience, take the same core, essentially, with a few additional courses that are electives. The MSQM is lockstep so has no electives, which is a big difference. If someone wants to explore additional functional areas like finance or marketing they will not have the opportunity to do that beyond the core course. The MSQM is also half the number of credits. They can’t get credit if they have already been granted the degree, which is a rule we are stuck with. However, if they want to make the transition to the part-time MBA program before the MSQM is granted we will transfer all of their credits. This is why we made the application process so similar – we don’t want to admit people to the MSQM program whom we would not admit to the MBA program. We are capping the first class at 50 to remain nimble. A smaller group means we can adjust on the fly if necessary. Ultimately we won’t have cohorts larger than 50 but may have multiple cohorts. We have five online certificate programs already and will develop more in the next year or so. In terms of an online MBA, it seems unlikely. We do have online content for pre-MBA content and online primers. Finish your application and get it in! Take the GMAT or GRE, and if you don’t like your score, take it again. We only take the highest score. Be thoughtful about your reasons for wanting to attend, and take time with your essay. If you don’t have a math background, taking some time to brush up would be helpful as it will really benefit you while in the program. It is exciting to combine business, analytics, and online. It is also exciting that we have signed up faculty who are among the best at Stern, who are excited to go through the process of developing online courses. We have an in-house learning science lab with experts in edtech and an in-house studio, and we are producing all of these ourselves. It takes about three months to produce a course from start to finish, and it is interesting taking a learning objective and exploring the tools available to achieve them in an online setting. • MIT Sloan Master’s in Finance: How to Get In! The post NYU Stern’s New Online Masters in Quantitative Management [Episode 306] appeared first on Accepted Admissions Blog. Applying to b-school is a challenging process – all the more so if you have weaknesses in your profile, such as a low GPA or GMAT score. It’s important to have a strong application strategy and an understanding of the role that low stats play in the admissions process. There’s still time to sign up for this week’s webinar, How to Get Accepted to B-School with Low Stats. Guided by Accepted’s founder, Linda Abraham, you’ll learn how to evaluate your profile from an admissions perspective; how to mitigate low grades and/or test scores; and how to adapt your application strategy to account for weak points in your profile. In just an hour, you’ll learn how to craft a successful application strategy! Sign up now. The post The Most Important Thing You Can Do This Week If You’re Worried About Your GMAT/GRE appeared first on Accepted Admissions Blog. Who makes up Stanford MBA Program’s entering 2018 class? Here’s a look at the class profile. Are you aiming to submit your R3 Stanford MBA application this spring? Or are you going to apply next fall? Either way – we can help! 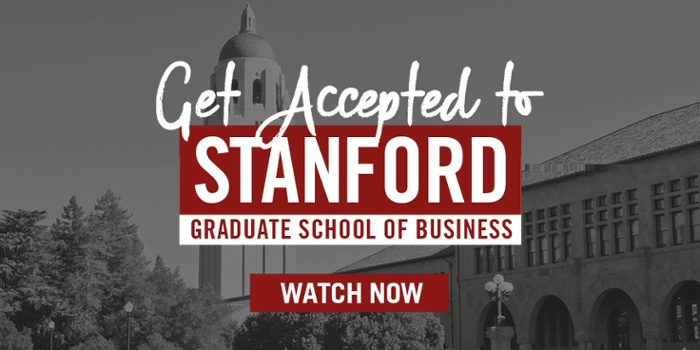 Check out our MBA Admissions Consulting & Editing Services and work one-on-one with an expert advisor who will help you create an application that will get you to the top of the Stanford GSB admit pile. Learn more here. Last updated on April 16, 2019. 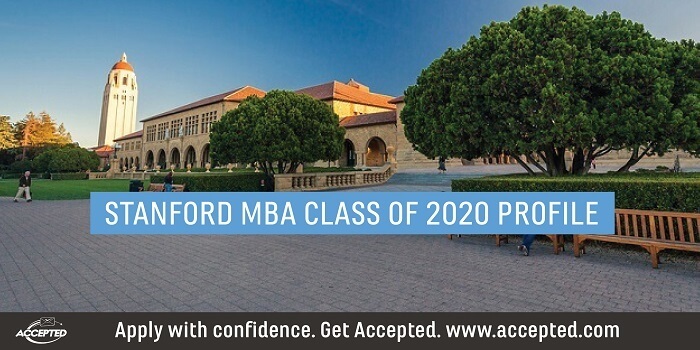 The post Stanford MBA Class of 2020 Profile appeared first on Accepted Admissions Blog. Learn how real students navigate their way through the business school admissions process and b-school itself with our What is Business School Really Like? series. 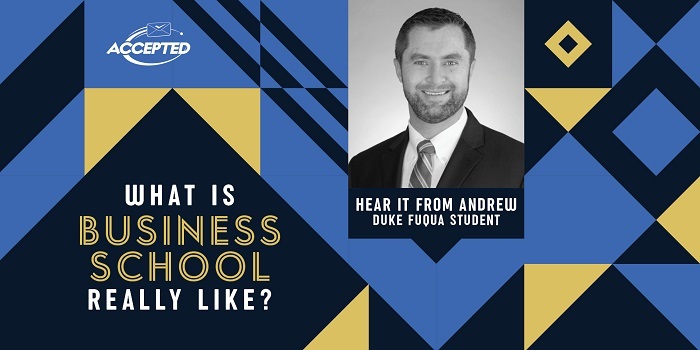 Meet Andrew, a Marine veteran, entrepreneur, new father, and first-year MBA student at Duke Fuqua. Andrew, thank you for sharing your story with us! What made you decide to go to business school? Andrew: Leaving the Marines I knew that in order to be hired into mid-level management positions, an MBA would be a good route for me to take. How did you decide which programs to apply to? Were you willing to relocate to attend school? Andrew: I only applied to Fuqua. I loved my experience so much that I put everything I had into being accepted. In theory, I would have relocated but I am local to Raleigh so relocating wasn’t my first choice. Applying to only a single business school shows real dedication. What was your level of familiarity with Fuqua prior to applying? How did you know it would be a good fit? Andrew: I visited Fuqua several times before applying, and I found everyone to be very open and welcoming. I was especially drawn to its veteran community. It didn’t take long for me to realize that Fuqua was where I wanted to be, and I decided that making a full commitment to Duke gave me the best chance to have success with its rigorous and competitive application process. My family and some of my friends thought I was a little crazy for applying only to Duke, but it was a risk I was willing to take, and I’m gratified it’s worked out so well. Did you experience any bumps along the road to business school admission? How did you identify and deal with the issues? Andrew: The experience in general is extremely stressful. I reached out to current students and alumni in order to get insight and help. What about extracurriculars? What extracurricular activities did you participate in either in the military or your civilian life? Andrew: I worked with a nonprofit organization called Warrior Wellness Solutions from 2013-2018. WWS is based in Durham and offers holistic health solutions to American military veterans who are wounded, ill, or injured. I’ve worked as a peer mentor and in event planning and fundraising. Working with the veteran community has been and continues to be a tremendously rewarding experience. Duke is known to have some creative (and tricky!) application essay questions. How did you approach your essays? How, specifically, did you approach the 25 Random Things About You question? Andrew: With my essays, I tried to caveat my experiences as an entrepreneur and Marine into a relatable experience with the culture at Fuqua. I took specific experiences I had and explained the lessons learned and how I would translate those lessons to better the Fuqua community I wanted to belong to. The essays are your chance to show a side of yourself outside of your resume. My 25 things essays highlighted highs, lows, growth, and experiences. I really tried to show the admissions team my true self outside of my resume. Once business school began, what surprised you most about the experience? Andrew: How thoughtful and friendly my classmates are. I wasn’t able to attend many social events because my wife was 8½ months pregnant. My section mates understood this and surprised me with signed books and baby gifts for my daughter. It was very touching and a huge surprise. Congratulations on the birth of your daughter! How do you manage to juggle your roles as student, husband, and father? Andrew: It was hard, especially at first, but I learned that Team Fuqua is for real. My classmates and first-year team really kept me afloat for the first few months after my daughter was born. They actually stopped class to surprise me with baby gifts. They bought us a mamaRoo bassinet and onesie pajamas, and my entire 76 student section signed books and left notes for my daughter. When I was struggling to keep up from lack of sleep, some of them took the time to help me in subjects within their areas of expertise, and they made sure I grasped the material well enough to pass my classes. It reminded me a lot of the Marines – the fact that it takes a team effort to achieve objectives. As for outside of the classroom, I put my duties as a father and a husband first. Things have gotten a little easier now that our daughter is older, and my wife and I have even found time to go out socially every once in a while. How have your experiences and duties in the Marines prepared you for business school and for the world of business? Andrew: Serving as a sergeant in the Marines taught me several things, including the value of teamwork and the importance of leadership skills. It also helped me develop the kind of work ethic that kept me going while attending school fulltime and working in my family’s entrepreneurial startup. Marines are taught to accomplish their mission no matter what roadblocks they may encounter, and even to make something out of nothing if that’s what it takes. I’m learning to apply those lessons in the business world and to share them with friends and classmates whenever it seems appropriate. What is Juicekeys and what role have you played in the company? Andrew: Juicekeys is an entrepreneurial startup created by my wife Kelly and her brother Chris. Kelly became interested in the power of healthy foods when she was transitioning from a career-ending gymnastics injury years ago. Like me, Chris is a former Marine, and he was exposed to many different juice bars when he was stationed in California. After he left active duty, he completed his MBA at USC Marshall and brought the vision of Juicekeys to Raleigh. It had very humble beginnings, with an original staff of only Kelly, Chris, and their parents. In three years, we have grown from one to three locations and we now have more than 45 employees. I started at Juicekeys in a managerial position and later became the director of operations. It’s pretty much a jack-of-all-trades job that includes leadership development, supply chain, customer relations, and whatever else might be needed at a particular moment. How did your civilian experiences in entrepreneurship make you a stronger MBA applicant? Andrew: This is a great question! When people tell me they want to be an entrepreneur, I usually give them the Southern response of “Bless your heart.” Being part of a startup isn’t for everyone. I know what it’s like working 20-hour days and taking no pay in the hope of growing a business into a successful venture. And we’ve been able to create what I and others think is the best juice bar in North Carolina. I’m confident that the things I’ve learned at Juicekeys, and also in the Marines, will help me as a mid-level or senior executive in a company that values people with a Fuqua MBA. What do you think your classmates would be surprised to know about you? Andrew: I am a complete teddy bear. The Notebook is one of my favorite movies. I told my wife on our second date I was going to marry her. She told me I was “crazy.” I laughed and said “You’re probably right, but I am going to marry you.” When I proposed to my wife I got in touch with Nicholas Sparks and had him sign her favorite book with the inscription “Kelly will you marry Andrew, with love Nicholas Sparks.” This December will be five years that we have been together. Did you grow up in the South, and if not, how do you have ties to the area? How has Duke’s location affected your business school experience? Andrew: I grew up in Chicago and Southern California. My wife’s family is from Raleigh. I love the area and think Durham is a great place to live. Was it difficult to become a student again after years spent away from the classroom? Andrew: I’m actually in my fifth year of school at this point. I started my undergraduate degree in 2014 while I was transitioning out of the Marines. It was discouraging at first because after taking placement exams at the local community college I had to start with developmental courses. My math score, for example, was around the eighth-grade level. I graduated from Campbell University with a 3.92 GPA in 2018 and started at Fuqua last August. It was definitely hard at times, but I had an amazing support system to give me a reality check when I needed it. Fuqua has definitely been the most difficult coursework I have personally experienced. The great thing is you’re always around amazing people who are extremely talented. So it is easy to push yourself in order to match the output of your peers. Working in teams has also been a huge help because more often than not one of us has experience in the subjects we may be covering and can help the group to understand better. Have you participated in a student internship? Andrew: I will be starting an internship in project management at Cisco this summer. I will be working on global strategy, planning, and operations. Cisco is a great company and it’s high on my list of places I’d like to work within the tech industry. I’m grateful for the opportunity and can’t wait to get started. Why did you decide to pursue an MBA as opposed to one of the many related graduate degrees that seem to be gaining popularity in recent years (Master’s in Finance, Master’s in Management, Master’s in Data Analytics, etc.)? Andrew: An MBA from Fuqua holds a lot of weight. We have world-class professors that teach every one of these subjects. For example, I could choose to major in Finance and Decision Sciences. In my opinion, not all MBAs are created equal. In my opinion, Fuqua is the best MBA program in the United States. We are truly a community that looks after one another. What are your plans, post-MBA? Andrew: I’d like to work in the technology industry in project or product management, with a backup plan of doing tech sales. The decision sciences, marketing, and strategy classes I’ve attended at Fuqua have been priceless in helping me prepare to accomplish that goal. What advice do you have for students beginning their MBA journey? Andrew: I would say be genuine, be intentional, be yourself, ask for help, and build relationships. I would not be at Fuqua if I didn’t have advocates in the form of admissions staff, current students, the Duke Armed Forces Association, and alumnus. I wanted to be at Fuqua more than any other school, so I really put myself out there with admissions. I sent updates on my progress and stayed in touch with staff. When the time came to choose candidates for acceptance there was no doubt how committed I was to coming to Fuqua. Do you have questions for Andrew? Questions for us? Do you want to be featured in our next What is Business School Really Like? post? Know someone else who you’d love to see featured? Are there questions you’d like us to ask our students in this series? LET US KNOW! You can learn more about Andrew by connecting with him on LinkedIn. To learn more about Juicekeys, click here. Are you setting out on your own b-school journey? We can help you reach the finish line! Check out our MBA Admissions Consulting Services to team up with an admissions expert who will help you join the ranks of thousands of Accepted clients who get accepted to their dream schools. The post Journey to Duke Fuqua: Marine-Turned-MBA, Entrepreneur, and Dad appeared first on Accepted Admissions Blog.